Upcoming multi-platform title Metal Gear Solid: Rising isn't MGS4 with a fresh coat of paint. Oh, no. According to the Kojima Productions podcast, Konami is developing a brand new engine for Rising to, as KP podcast host Sean Eyestone points out, "realize this multi-platform goal". "We're redoing the engine from scratch, and it's going to look amazing," says Eyestone. 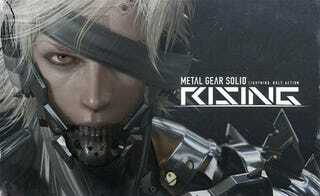 "It's going to be a big project like Metal Gear Solid 4. The entire team is serious about making it look as good as possible on every platform." The title Rising is a pun of sorts. The Japanese pronunciation "Raijin" is a word play on a mythic Japanese storm god. The character name "Raiden" means "thunder and lightning" in Japanese. Geddit? The title also has significance in English: "It's raising the Metal Gear franchise up to the next step."